Composite sandwich panels are incredibly useful materials to form strong lightweight structures used in everyday life. Sandwich panels using honeycomb, balsa, or foam are constantly helping to reduce weight and increase strength in a myriad of products today. This site is dedicated to providing useful information on all aspects of lightweight composite sandwich panels from both an engineering point of view, and from a non-engineers perspective. Learn the basics in how to repair a composite sandwich panel. In this case, a 747 fore flap. What is a Sandwich Panel - How does it work? 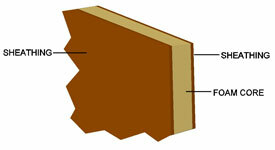 What is a composite sandwich panel: How the core and skin interact to create a lightweight structural panel material. SIPs - What is a Structural Insulated Panel? Section dedicated to the advancement of green sandwich structures. Highlighting the use of sandwich panels to save weight and better insulate. The most comprehensive online collection of composite sandwich panel and structural insulated panel video. Glossary of terms commonly used in the composite material and sandwich panel industry.